Picture by Ender Wiggins on BGG. I'm sure that being especially creative or innovative can be a joyful experience. 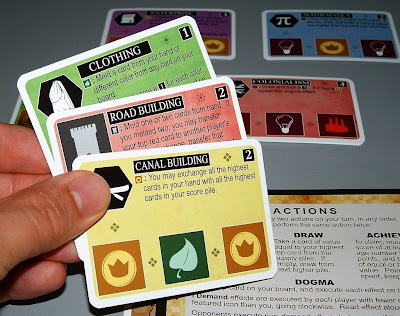 However, this post is about something much more concrete: the game Innovation by Carl Chudyk. I first saw this game being played at local cons. With somewhat clunky and unimaginative artwork/graphic design, I can't say I was very interested in exploring the game further. Soon after, I began hearing reports of the game's highly chaotic tenancies (more about this later). Yuck--moving on. Fast-forward to just a few weeks ago. I noticed a link on BGN referencing a lengthy and detailed discussion of Innovation on The Long View podcast between Geof Gambil (the host) and W. Eric Martin. I'm not exactly sure what made me download this episode and listen to it, but I had some extra time in the car and decided to give it a go. I am so glad I did. Eric spoke with energy and passion, claiming that he could play Innovation over and over again without tiring. They began to describe the game and speculate as to why it was such a mesmerizing game. They both noted the chaotic feel of the game, but talked about this being more like riding a roller coaster--a fun sort of chaos, and not without ways to control the flow. By the end of the podcast, I had resolved to give this game a real chance. Last week I bought the game, and we have been enjoying it ever since. Basically, Innovation follows the rise of a civilization from Stone Age (e.g., The Wheel) to Information Age (e.g., The Internet), featuring over one hundred unique technological advances. Players slowly (sometimes not so slowly) work their way up the ladder of success, gaining achievements along the way. Cards come with a special power and a number of symbols. The symbols in a pile of cards can be spread out to give your civilization an extra boost. Check out Ender's comprehensive pictorial review on BGG for more information about how to play. The game is chaotic, but it's the absolute best kind of chaos--controlled chaos. This is exactly what I want out of a game. Nearly all the games I have designed (and nearly all I own) feature this entrancing element. The excitement of not knowing what crazy card combination is coming next or what the unforeseen implications of a given strategy are going to be is what keeps me coming back. Carl Chudyk has turned a box with only two decks of cards into an unforgettable gaming experience. I highly recommend Innovation!